Change the conversation when discussing dietary protocol with clients. Instead of educating them on what they need to limit or "can't have" per diagnosis protocol, empower them with foods they CAN eat and healthy cooking techniques that can be utilized at home to prepare flavorful food. Bridge the gap of nutrition education with what clients understand about food. Learn how to educate your clients with evidence-based science, but translated through food along with behavior change techniques. Learn how to evaluate clients' cooking skills and confidence in the kitchen to set realistic food-focused behavior change goals. 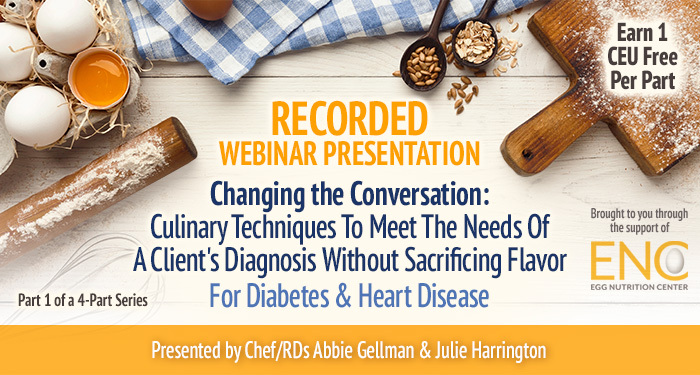 The live version of this webinar was presented on Thursday, March 14, 2019, from 2-3 pm ET, by Abbie Gellman, MS, RD, CDN, and Chef Julie Harrington, RD. This recorded version is approved for one hour of continuing education credit. RDs should list code 175 for this activity type. Make evidence-based nutrition education relatable to clients through "food talk". Discuss the impact culinary nutrition programs can have on behavior mediators such as stress, knowledge, confidence and goal setting. Identify a variety of culinary nutrition needs and tips related to some of the most frequently diagnoses diseases, including diabetes, autoimmune diseases, and heart disease, and how to help clients integrate them. 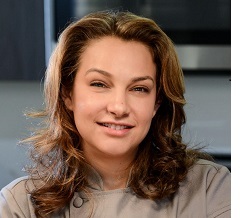 Abbie Gellman, MS, RD, CDN, is a Chef and Registered Dietitian and owner of Culinary Nutrition Cuisine, a culinary nutrition consulting company. 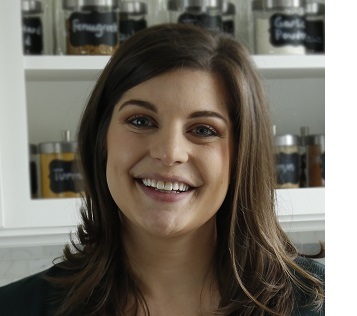 Abbie works with a wide variety of clients as a spokesperson, recipe and product developer, teacher/educator, and private chef. Follow her on Instagram and Twitter @CNC_Abbie and check out her weekly nutrition videos on YouTube and Facebook @CulinaryNutritionCuisine. This complimentary 1-credit continuing education webinar is brought to you with support from Egg Nutrition Center. Please note that Egg Nutrition Center provided financial support only and did not have input into the information provided in this course. The presenters have the following relevant disclosures to report: they have received honoraria and other material support from Egg Nutrition Center, National Dairy Council, and National Cattlemen's Beef Association. They have certified that no conflict of interest exists for this program. View our disclosure policy.